i know it changes brightness, or should, i asked question on other thread how to change it when i got it. i literally twisted it between strobe and light 20+ times and it was always dim. i pick it up couple hrs later and twist it once and its bright. any tips on the twist? twist it while on? off? just to strobe and back or it have some sweet spot? travelling, dont have it wth me. It has to be on when you twist. Have it tightened or loose. Turn it on. If it was loose, turn it tight and untighten again and tighten it, it will then change modes. Has anyone tried any other forward grip with a light built into it? Trying to find a solution that is not mounted on a rail and not with the recommended spot for the light now. I want to have options. Just wanted to see if anyone has had any luck. I just ordered the crimson trace mvf 515, comes in on Tuesday. I too was looking for a rail solution without dealing with Velcro touch pads. The reviews on the grip seem promising, but its not a cheap solution. Nonetheless, I figured if I'm gonna pay 2k for a gun what's another 399 to make it fully functional (along with my new eotech xps2). Funny that you posted that. I just purchased that on amazon. I have used other UTG stuff on my Rock River in the past. They are usually good. I would love to have the crimson, but I just cant fathom another $400+ for it. Great info here, I just installed the E1B into my Vector using the KRISS flashlight adapter and UE07. I saved a good bit of money from ordering everything from KRISS, getting the E1B for $112 from Amazon and the other Surefire parts from B&H. I got two rail adapters and the flashlight adapter from KRISS, which was the only vendor who charged shipping. I did get the SR07 too, but there are some issues with it I thought I'd mention to others who might do this install. In cannot be installed on the left side, as the wire will interfere with the charging handle. On the right side, the switch should be mounted so the wire exits on the stock side to minimize tension and give a neater appearance. Unfortunately, when installed in this manner it interferes with the folding stock - either you cannot fold it enough to engage its catch on the Vector body, or it will bend the wire's tension grommet which will cause early failure. The rail switch can be reversed so that the wire exits on the muzzle side, as in some of the pictures here, but this results in too much strain, likely culminating in premature failure. Also, if the stock is extended at all it via the hex screws, the rail switch will still interfere with the stock. Long story short, I just used the UE07 and affixed the tape switch to the indentation in the Vector body. Luckily I realized all this before getting out the Dremel. I'm left handed and wanted the tape switch on the left side so the fingers of my weak hand would be close by, but the wire isn't long enough to reach - it has to exit the flashlight compartment on the right side to avoid the charging handle. If Surefire makes a version with a longer wire that would work, but I don't believe they do. I have a M300A scout on another weapon so will use the SR07 on that, it's a nice product just has some issues being used on the Vector because of the folding stock on the right side and charging handle on the left side. Call Surefire and see if you can order one direct from them and ask what lengths they offer. Those are the ones I found on opticsplanet. 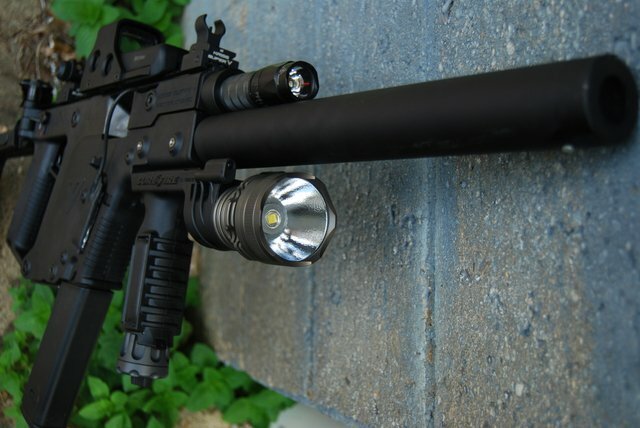 I have the Surefire M900 weaponlight with an 800 lumen head on it. You could get a MAKO light grip and add a 1" flashlight to it. There is even a grip that splits into a bipod. Check out this thread: http://www.krisstalk.com/t159-installation-of-e1b-light and try inserting the pressure switch from the bottom of the upper instead of feeding it in from the front. It will need to go into the slot at an angle, and it will be tight... and it will most likely scrape a slight bit of material off the switch but from where the cable connects and not the end of the pad (as shown in your video). I'd appreciate a scan of the "latest" version of the instructions KRISS is sending out if you have a flatbed scanner. I should work. Surefire lights are like lego. They have common components. The body of the light is the same (with a different name and markings) but they all fit the Kriss adapter. So if you already have the E1B installed, just get the EB1 and swap the head. I am more excited for the E1V. It has IR like my KM2 Scoutlight head but much slimmer profile. Anyone think about splicing this onto the EIB or Streamlight TL-2X? I have never heard of anyone doing it. Or does anyone have a better option for a pressure switch? I thought about splicing it even on a surefire. I don't think I would dremel my kriss to make the sr07 fit. The switch is waaaaay more cheaper than a Kriss. I'm still waiting for the E1V. Kipp wrote: Anyone think about splicing this onto the EIB or Streamlight TL-2X? I have never heard of anyone doing it. Or does anyone have a better option for a pressure switch? Kippm, scroll to the top of the page. See my picture? You can see my SR07 going into my KRISS and it controls my E1 surefire. No need to splice. it. The polymer upper is just that. A polymer shell. Just drill a hole and use the Surefire scoutlight tailcap to control your Surefire E1 series light. Is the upper avail to buy? I don't like cutting stuff unless I can put it back to original. Don't ask why, I think I am OCD like that or something. That's why I was looking to splice it. I don't see why not. I was able to buy a spare lower housing. Im sure you can call them and say what you want to do and tell them you want to buy the upper housing. You will need to transfer over all the components though. Considering the adapter is 35 thats not bad but 150 Lumens is on the low end. Hey Kipp, since I already have the light from Kriss on my rifle, do I need to buy an adapter for the cadet? or can I use the one I got? also, what about the cadet II? No, the Surefire s not compatible with cadet. Cadet tail cap is only $15 bucks. Cadet II is different as well. Cadet II won't fit. If I get the cadet, I will need to buy the switch for it, but I can use my adapter and sell my surefire.